Under the “Document” menu → “Document Properties” → “Background/Colors” → “Background Graphic” you can choose a picture to be displayed in the background. This picture can either already be in Papyrus or be an external picture linked by a reference. You can choose to “ Tile” the background picture, meaning it will be displayed in tiles. When your text is displayed in HTML in your internet browser (Explorer, Safari, Chrome, etc. ), all pictures will always be tiled, regardless of what you have selected in this dialog. 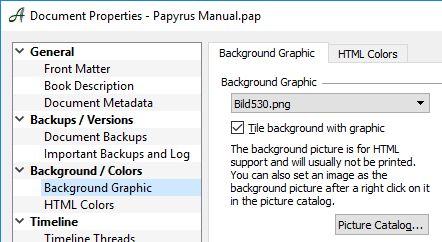 If you would rather access the picture catalog to choose your background graphic, simply click on the button in this dialog and use the context menu in the catalog to select your background graphic.